Wasp nests made in or near houses, such as in roof spaces, can present a danger as the wasps may sting if people come close to them. 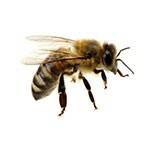 Stings are very painful but not dangerous, but in rare cases people may have a severe allergic reaction. You should get professional help removing an active wasps nest since wasps can be especially aggressive if they feel threatened. Keep garbage cans sealed and cleaned and get rid of garbage quickly and regularly. Vinegar is a good bait for a water trap for wasps. There is another non-chemical solution called a Queen Trap. Mechanical extermination of a wasp’s nest is recommended if the nest is indoors. Pest-Pro Specialists can come periodically to monitor your home and help prevent an infestation of WASPS.